FlashFXe is the only storage acceleration software for eMMC that dramatically improves random write performance – closing the “performance gap” – while improving endurance and reducing power consumption of your embedded device. Designed to be used with the Datalight Reliance Nitro file system, FlashFXe has been developed by the experts that created the FlashFX® family of flash memory management tools – the top choice for data-critical applications from leading OEMs for decades. Datalight’s responsive and accessible support engineering staff will help streamline your development and get your project done quickly and efficiently. 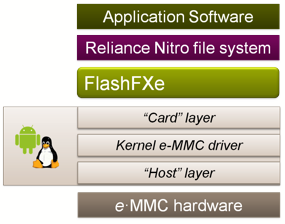 FlashFXe provides performance and endurance benefits for OEMs building embedded systems using eMMC for ease of integration and supply chain resilience. With flash-aware allocation, intelligent synchronization and host RAM caching, FlashFXe balances the write patterns of the application with the write patterns most suited to eMMC flash to enhance performance and minimize write amplification. Critical data integrity and reliability our customers expect from Reliance Nitro is uncompromised. Intelligent synchronization combines Datalight software’s reliability benefits with performance, offering users the flexibility to synchronize data to the media as and when necessary, all the time maintaining the critical data ordering. FlashFXe is especially suitable for multi-function mobile or portable devices with installable applications that rely on databases and offers power-saving benefits for battery powered devices. System responsiveness is a top requirement for all embedded devices. Most flash media marketing highlights best case sequential performance and shows impressive throughput. Random I/O metrics can be much different. And in the real world, all I/O is random I/O. FlashFXe + Reliance Nitro closes the performance gap by bringing random write performance up to sequential speeds. Each partition (or disk) can be scaled from 64 KB to 2 TB. For more information on how Reliance Nitro can help protect your valuable data in your next embedded design please complete the form below.